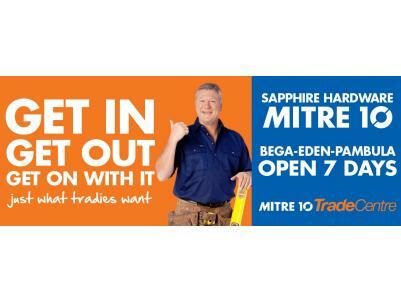 Sapphire Hardware, Mitre 10 Bega, Pambula and Eden have everything you need for that DIY job and for that professional Tradie job with a Trade Centre in each store. Located in three great locations on the Far South Coast Mitre 10 bring to you everything hardware, with a trained team to help you sort what you need and will deliver as well. Pambula Mitre 10 started out as an engineering and metal fabrication business in the early 1970’s. By the late 70’s timber and building supplies became the main focus and a change of ownership in 1990 brought the Mitre 10 name to the business to where it is today, the largest hardware, timber and building supplies store in the Bega Valley Shire specialising in trade, power tools and garden. Hardware and Building Supplies, doors, window and gate hardware, fasteners and ladders. Outdoor Living – Cooking, furniture, heating, lighting. Pool & Spa care, shade, accessories and more. Housewares and Laundry, Storage, organisation and shelving.